The aerial truck lift is a truck used to do lifting work in applications requiring work high above the ground, such as power system, advertisements, photography, telecom telecommunications, parks, transportation, ports, and more. The aerial truck lift is designed with four hydro cylinders and manual accelerator. Equipped with four H-shaped outriggers, our aerial truck lift can operate steadily. It can complete a 360 soin. Lifting hook is optional. Our aerial truck lift can lift up materials whose weight is in the range of 1 to 1.5t. The cab is designed with two rows of seats. It can hold five or six persons in it. If you're interested in aerial working platform truck, please kindly send email to szhj9999@163.com or talk to Anita by Whatsapp/Wechat/Mob. : +86 13329899995. More pictures of ISUZU Brand 16m aerial working platform truck manufactured by Chengli Special Automobile Co.,Ltd. as below. main technical parameters of ISUZU brand 4*2 LHD 600P double cabs overhead working truck manufactured by Chengli Special Automobile Co., Ltd. as below. 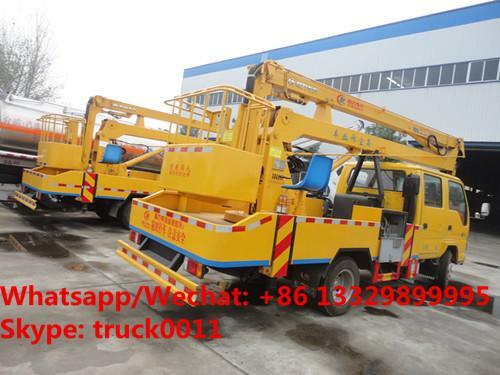 Chengli Special Autmobile is the leading manufacturer and supplier of truck with crane in China. With many years’ development, Chengli Special Automobile Co., Ltd. could supply cargo truck with crane, dump truck mounted crane, crane truck, etc. As a professional truck-mounted crane manufacturer in China, the truck-mounted crane for sale is from 2 ton to 32 ton. The drive type of our truck mounted crane are 4x2, 6x2, 6x4,8x4,etc. The crane we produce are telescopic boom truck mounted crane, knuckle boom crane.Also, Our crane trucks are 360 degree roatate. It is with high quality, long life, high speed, etc.More information, please feel free to contact with Ms. Anita. The hot sale line is 0086 13886878855.